We are in the middle of a period in the Jewish calendar called the Omer when we count the days from the second day of Passover until the beginning of Shavuot. Yesterday was Lag Ba’Omer, the 33rd day of the Omer. Traditionally during the Omer we refrain from certain activities like listening to live music but on the 33rd day, we are able to make an exception. 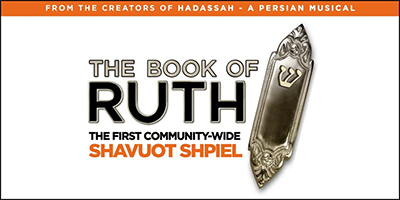 Last night on Lag Ba’Omer, a group of more than 60 extremely talented members of our Pittsburgh Jewish community put on a self-written and self-produced show entitled “The Book of Ruth: The First Community Wide Shavuot Shpiel”. There is a lot in that last sentence to explain like “shpiel” and why the Book of Ruth is important this time of year. I will leave it to you to use what I heard someone refer to as “Rabbi Google” if you want to understand any of these more than you might already. Steeltree, a fund managed by Federation young adult donors to inspire creative ways to engage other young people in Jewish life, along with our own Community Campaign dollars were granted to make this dream a reality. I attended the first of the two performances and I, along with the packed house at the JCC in Squirrel Hill, laughed and learned together. The creativity to tell the story of Ruth and why she is such an important figure from our tradition had real resonance. It was fun to listen to the music and hear the great one-liners and through this medium there was deep Jewish learning. Sunday at 3:00 pm will be the final performance. Get your tickets or more information online. Let’s Go Pens. To all the runners in the Pittsburgh Marathon, good luck. Shabbat Shalom.